The Seabourn Ovation will be introduced in Spring 2018, as an expansion of Seaborns ever-popular fleet of ships. Passengers will enjoy ultra-luxury facilities as well as innovative design. 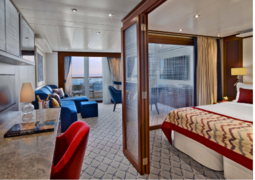 The Seabourn Ovation is packed with a wide variety of luxurious and comfortable Suites. 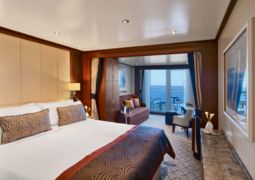 The cabins have been designed with premium and pristine mahogany wood which adds to the unique identity of this vessel. The suites have amenities such as walk-in closets, separate bathtubs and showers as well as a fully stocked bar. On board the Seabourn Ovation there are multiple dining options as well as room service to satisfy all your culinary needs. There is a mix of casual and fine dining outlets available. The Seabourn Ovation has a unique partnership with the highly revered Michelin-starred Chef Thomas Keller which brings his award-winning cuisine to the Ovation. The expert chefs and waiting staff will satisfy all your culinary desires. Only the freshest and most authentic ingredients are used by the chefs to conjure up your desired meals. There is a wide array of entertainment outlets to take advantage of on board the Seabourn Ovation. Enjoy a drink in the stunning "Observation Bar" where you can listen to serene music from the pianist and observe beautiful panoramic views. Alternatively you can visit the "Sky Bar" and enjoy a beverage while overlooking the 'Pool Patio'. In "The Club" guests can consume premium beverages and cocktails in a lounge that radiates elegance. In addition to this, the "Club Terrace" is a luxurious al fresco space where guests can relax and swim in the plunge pool or the two whirlpools. If peace and quiet is your preference than the "Retreat" is the place for you. It is a tranquil setting packed with 15 private Cabanas, HD flat screen televisions, refrigerators and an additional "Spa Treatment Cabana". There is an endless amount of activities for you to engage in on board the Seabourn Ovation. Fitness fanatics will be satisfied with the luxurious state-of-the-art ocean-view gym where personal trainers are on hand to offer their expert advice. "The Spa at Seabourn" is an ideal place to relieve yourself of all stress with a sophisticated menu of massages, wraps and therapies available. Additionally guests can participate in the highly revered enrichment program designed by Dr. Andrew Weil. This program focuses on the physical, social, environmental and spiritual well-being of the participants and is based on Dr. Weil's best selling books. There are various outlets on board the Ovation to satisfy the needs of all Shopaholics. Feel free to purchase exclusive branded clothing with Seabourn's logo which is the perfect souvenir or gift to remember your stay on the Ovation. In the Boutique you can purchase top quality cosmetics and luxury goods from all the famous brands and designers. It is also possible to purchase deluxe jewelry such as watches and pristine diamonds.